Of the three solutions Google launched targeted at helping job seekers and employers come together, the job search API, dubbed Cloud Talent Solution, gets the least amount of publicity. Google for Jobs, the company’s answer to Indeed, and Hire by Google, its answer to the ATS market, in contrast, grab more of the headlines. Cloud Talent Solution, the technology that lets job boards and employers plug Google’s search technology into their websites, is apparently no less important, and as this week’s news release highlights, is not coming up short in the development roadmap. In those early days, Johnson & Johnson touted an 18 percent increase in job applicants per search and a nearly 25 percent increase in clickthrough rate on its career site. Today, the list of adopters has grown, with names like SmashFly, College Recruiter, Phenom People, and Symphony Talent using the technology to put their job search technologies in the hands of Google. And good for them, Google keeps rolling out the enhancements. First up, job seekers can now get detailed commute information when doing searches. For years many job boards have been delivering search results based on proximity to the user, but this regularly falls short of helping candidates determine commute times. Five miles in San Francisco, for example, is not the same as five miles in, say, Cleveland. College Recruiter has been using the technology for awhile now, and president and founder Steven Rothberg speaks favorably about the upgrade. Users can filter searches to show only the jobs that are within, say, a 10-minute walk, or a 30-minute bicycle ride. Then the search results will update and the pins will update in real time. In addition to commute information, Cloud Talent Solution has also updated its product to provide translation solutions for up to 100 different languages. Now, job seekers can see jobs in the language they searched, as well as jobs in English. 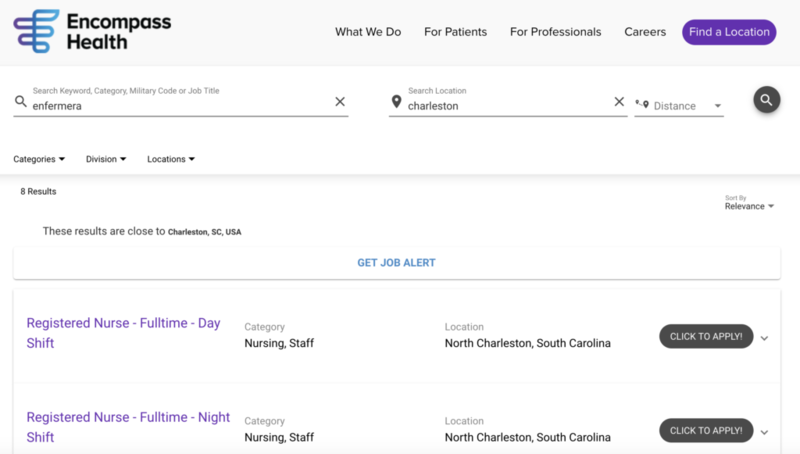 For instance, if someone searches for a job by using the word “enfermera,” which is the Spanish word for “nurse,” they’ll get results in English. Here’s a screenshot of the example. Google’s Clout Talent Solution Now Supports Job Searches in Up to 100 Languages. Google says companies are constantly looking for new ways to reach a larger talent pool, and every job seeker has their own unique job search and employment needs. This update will apply Google Cloud AI capabilities to helping companies provide more relevant job opportunities to a wider candidate base. More than 4,000 sites are currently using Cloud Talent Solution to power their job searches. Pricing starts at free for sites with fewer than 10,000 searches a month to custom pricing for those with more than 10 million searches monthly. In between, you’ll pay anywhere from $3 – $1.50 per 1,000 queries, by monthly usage. Google will be talking in depth about its employment-related solutions as Cloud Next ‘19 in San Francisco, coming on April 11.